The winter is coming. The holiday are approaching quickly. Make sure that your water heating system is ready to provide enough hot water for usage of all family members and guests. If your old water heater isn’t working effectively and is taking a long time to handle the job like it used to, you may need to look at a new water heater. This guide explores standard 50-gallon tank water heaters – gas and electric powered, as well as heat pump water heaters to help you decide which is best for your needs. To find the best, we consulted plumbers, combed through user reviews, and compared the specs of every model we could find. We recommend reading the full article before making a final decision. It’s important to understand your family needs first so you have a frame of reference to evaluate the various 50-gallon water heater we review here. Before you go out to look for a 50-gallon hot water heater, first you need to answer the question: is this the right size? Hot water accounts for about 25% of the average home energy costs, so it’s important to get this right. If you install a tank that’s too small, you’ll run out of hot water before finishing the shower. And if you get a tank that’s too big, you’re wasting money on heating water they won’t use. To get the right size of the water heating system, simultaneous use is one of the most important factors to consider. Your hot water heater should provide enough hot water for the usage of multiple sources of water at the same time. For example, you are showering while your wife is using a washing machine, dishwasher and sinks, it can be easy to deplete your hot water supply quickly. To properly size a tank water heater for your home, use the water heater’s first-hour rating. The first-hour rating is the number of gallons of hot water the heater can supply per hour (starting with a tank full of hot water). The first-hour rating is shown on the top left corner of the Energy Guide. 50-gallon gas water heaters will typically have a first-hour rating in the range of 70-80 gallons; 50-gallon electric water heaters will typically have a first-hour rating around 60 gallons. If you assume an 8-minute shower, you will consume about 15 gallons (or 56 liters) of hot water. If all four people in your family take their showers simultaneously in the morning, you would need a storage hot water system with 60-gallon first hour rating. This all presumes that you are not using any other hot water devices at the time. Determine what time of day (morning, noon, evening) you use the most hot water in your home. Keep in mind the number of people living in your home. Determine the avg. gallons of hot water that will be used during that hour. Choose a tank with a first-hour rating that is close to your peak hour demand figure. Use the worksheet below to estimate your maximum usage of hot water during this one hour of the day – this is your peak hour demand. A 50-gallon hot water heater is best suited for three bathroom homes or a home with two baths and a washing machine. Washing machines require 20 gallons of hot water; dishwashers need 10, while a one-person bath requires at least 10 to 15 gallons of hot water. Choosing Electric or Gas or Heat Pump Water Heater? When selecting a new 50-gallon water heater for your home, it’s important to consider what fuel type or energy source you will use. The fuel used by a water heating system will not only affect annual operation costs but also the water heater’s size and energy efficiency. There are 2 main fuel types that power 50-gallon water heaters: Electricity, Gas. Electric water heaters are very popular and they are the least expensive to purchase. They use large coils that hang down into the tank to heat the water. The coils are similar to the ones in an electric oven. The best water heaters offer what is called dry fire protection, which means that the upper heating element can detect if it is surrounded by water and, if it is not, shuts off the heat to prevent the unit burning out. Generally, electric water heaters aren’t as efficient as those powered by other fuel sources, and electricity is more expensive than natural gas or propane. However, they’re less expensive up front and don’t require venting. If your water demand is small, then it may be the best water heater to buy. The main disadvantage of an electric water heater is the relatively slow recovery rate. A typical 50-gallon electric unit set to 120 degrees takes about 1 hour and 20 minutes to heat water coming into the unit at 60 degrees. Conversely, when the water entering this same tank is 40 degrees, it takes 1 hours, 47 minutes to heat it up. For 70-degree water entering the tank, it takes 1 hour, 6 minutes to reach its full heat of 120 degrees. A gas water heater will heat the water with a gas burner in the bottom of the tank. Each time the water temperature falls below a set level, a gas burner will ignite to bring the water back up to the desired temperature. Most Americans use natural gas for their water heating system. A far smaller percentage use propane gas. Both natural gas and propane (LP) water heaters are generally more expensive to purchase than electric models. Gas water heaters are less energy efficient than electric heaters, but the cost of electricity itself makes the running costs of an electric heater higher. Gas water heaters also have a much faster recovery rate, which makes them a convenient option for larger families. A gas heater can heat a 50-gallon tank in about one hour. Its recovery rate is much faster than that of an electric heater. To get the recovery time for a gas unit, take the electric hot-water heater recovery times and divide them in half. Water coming into a 50-gallon tank at 40 degrees takes just 53 1/2 minutes to reach 120 degrees. For 60-degree water entering the tank, calculate about 40 minutes needed for the water to reach the 120-degree temperature. For 70-degree water, it would take 33 minutes. Another advantage of gas water heaters is that they’ll still work in the event of a power outage. For families of four or more people, a gas heater is usually a better choice over electric, as an electric heater is likely to have trouble keeping up with the hot water demands of a larger family. While air conditioners and freezers are familiar examples of heat pumps, a heat pump also can be used to heat water – either as a stand-alone water heating system, or as combination water heating and space heating system. Heat pump water heaters are powered by electricity. To understand the concept of heat pumps, imagine a refrigerator working in reverse. While a refrigerator removes heat from an enclosed box and expels that heat to the surrounding air, a heat pump water heater takes the heat from surrounding air and transfers it to water in an enclosed tank. Therefore, they can be 2-3 times more energy efficient than conventional electric resistance water heaters. So they are the best option to buy if saving money on gas and electric bills is important in your choice. However, heat pump water heaters are much more expensive than gas and electric water heaters. The main disadvantage of a heat pump water heater is that its recovery rate is much lower than the recovery rate of a gas water heater. Once the 50-gallon tank has been depleted you could be waiting for up to 8 hours until it can recover and provide a full tank of hot water again. One more thing, heat pump water heaters will not operate efficiently in an extreme cold space. So if you’re more concerned with having enough hot water and not running out, a 50-gallon gas water heater is best. 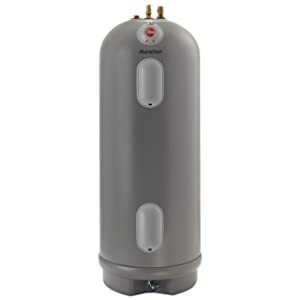 If you’re interested in saving money in the long run, a 50-gallon hybrid heat pump water heater is the best. Energy Factor: A water heater’s energy efficiency is determined by the energy factor (EF), which is based on the amount of hot water produced per unit of fuel consumed over a typical day. The higher the energy factor, the more efficient the water heater. The best 50-gallon water heaters should have at least a .62 EF. Energy Star: a 50-gallon water heater that has earned the Energy Star is about 15 percent more efficient than standard models. The A.O. Smith GPVL-50 ProMax Power Vent is the best 50-gallon gas water heater available. It is engineered to maximize efficiency while offering greater flexibility in installation options. With a 0.7 Energy Factor, this water heater is ENERGY STAR qualified. It’s eligible for the local utility and rebate programs. Most states are offering rebates in the $50 to $250 range. Featuring a 50-gallon tank and a 40,000 BTU gas burner, the GPVL-50 Power Vent delivers a first-hour rating of 90 gallons and a recovery rate of 44.7 gallons per hour. This unit is ideal for large families with high demand for hot water. It provides enough hot water for 3 showers at the same time. This unit features Dynaclean II dip tube which optimises inlet water pressure to minimize cold water regions within the tank. The self-cleaning action also reduces sediment accumulation on the bottom of the tank. Its hot-surface ignitor is more robust and reliable than standing pilot and reduces energy consumption. This 50-gallon gas water heater also has built-in heat traps on the water inlet and outlet reduce the amount of heat lost through piping. All ProMax models from A.O. Smith features an exclusive 3-position rotatable blower outlet which adds flexibility. They are also equipped with a protected sensor that detects the presence of flammable vapors and automatically disables the burner to prevent ignition. A specialty vent gas water heater options can be installed almost anywhere in your home because they can vent up to 40 feet. Comes with 6-year limited warranty and an affordable price, the A.O. Smith GPVL-50 ProMax Power Vent is the best 50-gallon gas water heater we reviewed. 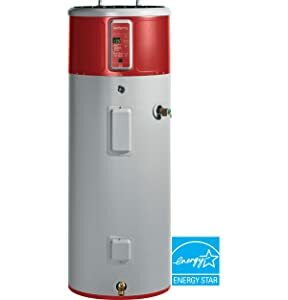 If you’re looking for the best 50-gallon electric water heater that saves energy and money, the Westinghouse Residential Stainless Steel is for you. With a .95 Energy Factor, this is one of the highest efficiency water heaters on the market. As mentioned above, the best 50-gallon water heaters should have at least a .62 EF. So this unit will provide long draws of hot water without consuming large amounts of energy. The Westinghouse Electric Water Heater is manufactured with the highest quality materials to provide the most efficient heating experience. Its high-grade stainless steel incoloy elements with low watt density are more durable and resistant to corrosion, making them the longest lasting elements in the industry. Its 52-gallon stainless steel, laser welded tank lasts longer and eliminates the need for anode rods. Standard, coated tanks require anode rods to delay inevitable corrosion and tank failure. This stainless steel tank eliminates this requirement, allowing for resistance against scale build up, easier maintenance, and a tank that lasts a lifetime! Not only does the Westinghouse Residential electric water heater provide adequate water heating for your household, its adjustable thermostat provides adequate temperature control so you’ll always be comfortable. The high limit control on the unit protects against overheating, so you never have to worry! 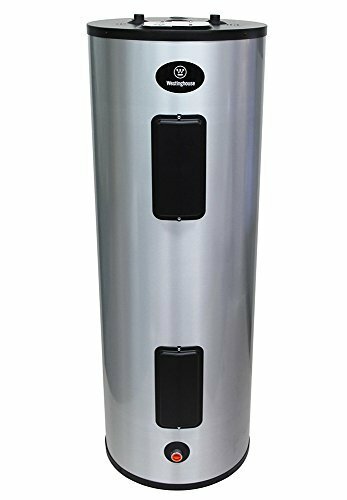 This Westinghouse water heater is a perfect addition to your home, it has received so many positive reviews on Amazon. Overall, it is one of the best 50-gallon electric water heaters you can buy. If you ask any heat water expert what is the best 50-gallon electric hybrid heat pump hot water heater to buy, most of them will say “It’s GE GeoSpring”. The GE GeoSpring Hybrid Electric Water Heater is one of America’s most efficient 50-gallon water heaters with 70% more efficient than a standard electric water heater. It delivers all the hot water you need and since it uses the same water and electric connections, installation is fast and easy. The GE GeoSpring is an Energy Star qualified device which exceeds federal guidelines for energy efficiency and provides year-round energy and money savings. It provides the same hot water recovery as a traditional 50-gallon standard electric water heater with 65 gallons first-hour rating. With an impressive 3.25 Energy Factor, it can save the average 2-4 person household $160-$330 every year on average in water heating expenses. The best feature of this unit is that it can be controlled via GE Wifi Connect. Like some smart air conditioners with an add-on device allows you to control the unit from your smartphone, you can use the GE wifi connect module (purchased separately) to monitor your water heater using the GeoSpring app. If you want to buy a 50-gallon electric heat pump water heater from a trusted brand with great customer services, the AO Smith 50 Gallon Voltex Residential may be what you’re looking for. This unit has been designed to dramatically decrease the cost of operation. With up to a 3.24 Energy Factor (EF) rating (compared to an average .75−.95 EF rating of a standard electric model), this innovative water heater can cut annual operating costs by more than half. The AO Smith 50 Gallon Voltex Residential uses heat pump technology to deliver tremendous savings by generating heat through the heat pump technology instead of the heating elements. It offers premium features including a user-friendly display, vacation mode to save money while you are away, and a heavy duty anode that protects your tank for 6 years. In addition to the heat pump technology, this model also has two heating elements that help the water heater recover quickly during periods of high demand. This 50-gallon heat pump water heater has a first house rating around 66 gallons so it is the best options for the family of 3 to 4 people. Bradford White was established in 1881 and has grown from strength to strength over the years to become the leading water heater manufacturer. With state of the art technological advancements, and a high-class research and development facility, Bradford White has become an innovative leader in the commercial, residential and industrial wholesale water heater, space heating, and water storage, and combination heating industry. The Bradford White 50 Gallon Defender Atmospheric Vent Energy Saver features intelligent diagnostics through an LED screen that give you 10 different indicators of how your water heater is functioning. There is also a flashing light so you can tell if the pilot light is operating as it should. Its 50-gallon tank was made from stainless steel with a durable enamel lining protects it from corrosion. The tank’s heat is conserved with eco-friendly foam insulation that reduces energy use and helps the system operate more efficiently so you save money on utility bills. Factory-installed heat traps cut down on heat loss in the pipes, which also trims the energy consumption. Another advantage of the Bradford White 50 gallon gas water heater is its Recovery Rise. A 90° recovery rise for this tank is about 43 minutes. In other words, when the cold water enters the hot water tank, it will take just about three-quarters of an hour to rise 90° inside the tank. This tank is 60 1/2″ from the floor to the Flue Connection and the jacket diameter is 22″ wide. Featuring an input of 40,000 BTUs, it has a First Hour Rating of 89 gallons. The Bradford White is designed to be the safest, most reliable flammable vapor ignition resistant system in the industry meeting all the requirements set forth by the American National Standards Institute. Overall, it’s one of the best 50-gallon natural gas water heaters available. In terms of energy saving, the Rheem MR50245 Marathon Electric Water Heater is unmatched compared to other standard electric water heaters on the market. This 50-gallon electric water heater has an impressive Energy Factor of .95 which is higher than most comparative units. It uses electric immersion water heater elements which transfer 100% of their energy into heat. It also significantly reduces heat loss due to a Polyurethane Envirofoam insulation-filled tank shell. This foam traps the heat inside the tank and keeps the water hotter for longer periods of time without power cycling the elements to reheat the water. This water heater is made of cross-fiber polybutene creating a stronger and higher quality electric water heater with much longer life expectancy than regular steel electric or gas water heaters. Marathon water heaters come factory equipped with one fused upper heating element to protect against dry firing and a lower titanium plated water heater element that provides greater protection against lime and sediment buildup compared to copper or steel elements used in standard electric water heaters. Rheem MR50245 Marathon Electric Water Heater is the best option for efficient and reliable hot water. This quality product with seamless, blow-molded tank design not only looks good in homes, but also provides energy cost savings and a lifetime limited warranty against leaks for as long as you own your home. If the home is sold, the warranty transfers to 15-year warranty from the date of the original installation. The next owner receives warranty coverage for the time remaining. All elements and parts are warranted for 6 years from manufacturing date against factory defects.